Atongno Humphrey Ashu, PhD (c), is a Cameroonian, graduated with a BSc (Hons) in Nursing in 2007 from the University Buea. He obtained MSc (Hons) in Nursing Education in 2012 and Post Graduate Diploma in Anaesthesia and Critical Care in 2017. He also has clinical diplomas in haemodialysis and cardiac surgery patient’s care. Atongno Humphrey is a devoted clinical practitioner in the Douala General Hospital since 2009, and Educator in Nursing Schools in Cameroon. He has been trained in air pollution monitoring in 2015, 2016, 2017 (LACE projects) and 2018 (IMPALA/LuLi projects). He had also been trained in spirometry in 2012 in Obafami Owolowo University Nigeria for the BOLD study and 2018 in Douala-Cameroon for the IMPALA /LuLi projects. He has worked as research field coordinator from 2013 to 2015 in the Burden of Obstructive Lung Diseases (BOLD) study in Cameroon in collaboration with the Imperial College of London (Professor Peter Burney). He has also served as a research project manager for the LPG Adoption Evaluation (LACE) study in Cameroon were he managed the projects carried out community organization and mobilization in collaboration with Liverpool University (Dr Dan Pope and Pr Nigel Bruce). Atongno Humphrey is currently a PhD student in Public Health in the Faculty of Health Sciences, University of Buea, currently working on Households Combustion Related Air Pollution and Respiratory Health in Cameroon under the supervision of Pr Njunda Anna, Pr Assob Jules and Dr Sama Martin. He is also currently the research project manager of the IMPALA and LuLi projects in Douala-Cameroon. Currently a PATS MECOR level one student, member of the Cameroon Respiratory Society (CRS), member of the Pan Africa Thoracic Society (PATS) and member of the European Respiratory Society (ERS). Atongno is a dynamic, critical thinking, focused and determine young man with leadership qualities. He enjoys working as in a team and in professional networking. 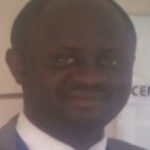 Atongno has the passion for teaching and is interested in environmental health and research, continuous professional development (CPD) and lifelong learning (LLL). He is married to Gilda with three children.